A fifth of UK smokers plan to quit when the ban on smoking in enclosed public spaces comes in, a survey suggests. The poll, by the No Smoking Day organisation, says that 22% giving up as a direct result of the ban would mean more than 2.8m smokers quitting. 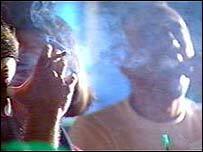 But pro-smoking group Forest said the idea that so many people would quit as a result of the ban was "laughable" . MPs voted last month for the ban from summer 2007, rejecting proposals to allow some pubs and clubs to opt out. Before the legislation was approved the government predicted it would lead to 600,000 people quitting. A second poll, by Cancer Research UK, found one in five GPs has already seen an increased number of patients asking about quitting smoking since the ban was approved. Both polls were released to mark No Smoking Day. The No Smoking Day survey, carried out by research organisation GfK NOP in the days after the total ban was confirmed, is the first measure of public opinion since the Commons voted on the issue. Some 22% of smokers said they would stop smoking for sure and almost half (48%) of those questioned said the ban would make them try to quit. Ben Youdan, chief executive of No Smoking Day, said: "The response to the ban from smokers is fantastic. "It proves that MPs were absolutely right to take the bull by the horns and vote for an outright ban on smoking. "The ban was clearly the impetus people needed to help them decide to give up for good. "The knock-on effects for their own health, and that of their children and partners, will be incalculable." Mr Youdan said it was key that the NHS had the resources in place to help the increased number of people who wanted to quit smoking. Caroline Flint, the Public Health Minister, welcomed the findings. She said: "It is clear that the historic vote by Parliament last month will have a significant effect on improving the health of those who give up and people who spend time in smoky environments." Cancer Research UK surveyed 583 GPs, and found 117 had noticed a rise in the number of patients enquiring about quitting smoking. Professor Robert West, the charity's director of tobacco studies, said the great majority of smokers wanted to quit, but were often put off because they thought it would be difficult. "These findings reflect the importance of new government policies in triggering action. "For every two smokers who stop smoking on average one miserable premature death is averted." Simon Clark, director of the pro-smoking lobby group Forest, described the idea that 22% of smokers would definitely quit as a direct result of the public smoking ban as "laughable". "It is typical of the consistently exaggerated estimates, calculations and unashamed spin that the anti-smoking lobby employs to justify its increasingly offensive attack on smoking. "Of course, some people will quit and others will cut down, but there is nothing to suggest that a public smoking ban will encourage people to quit in such large numbers. "In Ireland cigarette sales initially fell and then went back up again," he added.